A celebrity chef is a kitchen chef who has become a celebrity. Today, chefs often become celebrities by presenting cookery advice and demonstrations, usually through the mediums of television and radio, or in printed publications. While television is ultimately the primary way for a chef to become a celebrity, some have achieved this through success in the kitchen, cook book publications, and achieving such awards as Michelin stars, while others are home cooks that won competitions. Two Fat Ladies is a BBC2 television cooking programme starring Clarissa Dickson Wright and Jennifer Paterson. It originally ran for four series, from 9 October 1996 to 28 September 1999, being produced by Optomen Television for the BBC. Since then, the show has been repeated frequently on the Food Network and Cooking Channel in the U.S. and on the Australian Broadcasting Corporation in Australia. In the UK, the show has been transmitted many times on the satellite channel Good Food. Clarissa Theresa Philomena Aileen Mary Josephine Agnes Elsie Trilby Louise Esmerelda Dickson Wright was an English celebrity chef, television personality, writer, businesswoman, and former barrister. She was best known as one of the Two Fat Ladies, with Jennifer Paterson, in the television cooking programme. She was an accredited cricket umpire and one of only two women to become a Guild Butcher. The pair were famous for their rich traditional meals made from scratch. Paterson was known for her liberal use of butter and cream, remarking on her television show in her usual manner with a shake of the hand, that yoghurt was only fit for vegetarians and those with "a poor tummy". They travelled to filming locations throughout the UK on Paterson's Triumph Thunderbird motorbike with Dickson Wright occupying the sidecar. The Triumph Thunderbird is a British motorcycle that was introduced by Triumph in 1949 and produced in many forms until 1966. The name was used three more times for new and distinct Triumph models. A sidecar is a one-wheeled device attached to the side of a motorcycle, scooter, or bicycle, making the whole a three-wheeled vehicle. A motorcycle with a sidecar is sometimes called a combination, an outfit, a rig or a hack. Reading is a large minster town in Berkshire, England, of which it is now the county town. It is in the Thames Valley at the confluence of the River Thames and River Kennet, and on both the Great Western Main Line railway and the M4 motorway. Reading is 70 miles (110 km) east of Bristol, 24 miles (39 km) south of Oxford, 40 miles (64 km) west of London, 14 miles (23 km) north of Basingstoke, 12 miles (19 km) south-west of Maidenhead and 15 miles (24 km) east of Newbury as the crow flies. Paterson was a committed Roman Catholic who never married or had any children. She was diagnosed with lung cancer in July 1999 and died a month later in London. She asked for caviar for her last meal but died before she could eat it. Following a traditional funeral mass, she was cremated at Putney Vale Crematorium and her ashes were interred in the cemetery there. 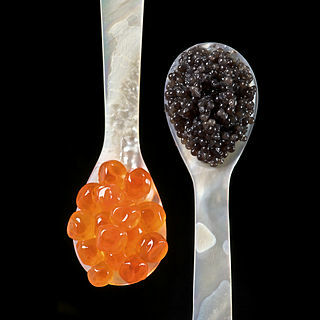 Caviar, , is a delicacy consisting of salt-cured roe of the Acipenseridae family. Caviar is considered a delicacy and is eaten as a garnish or a spread. The roe can be "fresh" (non-pasteurized) or pasteurized, with pasteurization reducing its culinary and economic value. The London Oratory is a Catholic community of priests living under the rule of life established by its founder, Philip Neri (1515-1595). It is housed in an Oratory House, next to the Church of the Immaculate Heart of Mary in the Brompton Road, Royal Borough of Kensington and Chelsea, London, SW7. Enjoy! : A Celebration of Jennifer Paterson –Tribute to a Fat Lady by Her Friends ( ISBN 978-0747272878) 2000. Nigella Lucy Lawson is an English food writer and cooking show host. She is the daughter of Nigel Lawson, a former Chancellor of the Exchequer, and Vanessa Lawson, whose family owned the J. Lyons and Co. food and catering business. The Forme of Cury is an extensive collection of medieval English recipes from the 14th century. Originally in the form of a scroll, its authors are listed as "the chief Master Cooks of King Richard II". Delia Ann Smith is an English cook and television presenter, known for teaching basic cookery skills in a no-nonsense style. One of the best known celebrity chefs in British popular culture, Smith has influenced viewers to become more culinarily adventurous. She is also famous for her role as joint majority shareholder at Norwich City F.C. Her partner in the shareholding is her husband, Michael Wynn-Jones. The Art of Cookery made Plain and Easy is a cookbook by Hannah Glasse (1708–1770) first published in 1747. It was a bestseller for a century after its first publication, dominating the English-speaking market and making Glasse one of the most famous cookbook authors of her time. The book ran through at least 40 editions, many of them were copied without explicit author consent. It was published in Dublin from 1748, and in America from 1805. Hannah Glasse was an English cookery writer of the 18th century. Her first cookery book, The Art of Cookery Made Plain and Easy, published in 1747, became the best-selling volume of its type that century. The book was reprinted within its first year of publication, appeared in 20 editions in the 18th century, and continued to be published until well into the 19th century. She wrote two subsequent books, The Servants' Directory (1760) and The Compleat Confectioner, which was published undated, but probably in 1760; neither was as commercially successful as her first book. Patricia Llewellyn was a British television producer and managing director of the television production company, Optomen, which in 2010 became part of the All3Media group. The Closet of the Eminently Learned Sir Kenelme Digbie Kt. Opened, commonly known as The Closet Opened, is an English cookery book first printed in 1669. It is supposedly based upon the writings of Sir Kenelm Digby, being as the title page states "published by his son's consent". Sussex pond pudding, or well pudding, is a traditional English pudding from the southern county of Sussex. It is made of a suet pastry, filled with butter and sugar, and is boiled or steamed for several hours. Modern versions of the recipe often include a whole lemon enclosed in the pastry. The dish is first recorded in Hannah Woolley's 1672 book, The Queen-Like Closet. Spilling The Beans is an autobiography written by Clarissa Dickson Wright and first published in 2007. 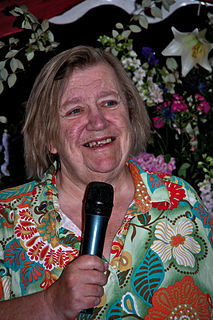 Annabelle White is a New Zealand food writer and author of eleven cookbooks. She was a long time food columnist for the Sunday Star-Times and also wrote the popular Food Detective column. She is the former food editor for NZ House & Garden and in October 2011 joined the New Zealand Women's Weekly as Food Editor. The author of eleven cookbooks Annabelle is also busy with cooking classes and the public speaking circuit. A Book of Mediterranean Food was an influential cookery book written by Elizabeth David in 1950, her first, and published by John Lehmann. After years of rationing and wartime austerity, the book brought light and colour back to English cooking, with simple fresh ingredients, from David's experience of Mediterranean cooking while living in France, Italy and Greece. The book was illustrated by John Minton, and the chapters were introduced with quotations from famous writers. Thomas Dawson was an English author of cookery and housekeeping books. The Queen-like Closet, Or, Rich Cabinet was a cookery book published in 1670 by the English writer on household management, Hannah Woolley (1622–c.1675). It ran through 5 English editions by 1684. At least two German editions were also printed. ↑ Owen, Emma (1999-08-11). "Jennifer Paterson death". The Guardian. Retrieved 23 August 2018. ↑ Jennifer Paterson (1990). Feast Days, Recipes from The Spectator (London: John Murray Publishers), p. xi. 1 2 Nemy, Enid (11 August 1999). "Jennifer Paterson, 71, Dies; TV Cook From 'Fat Ladies'". The New York Times . Retrieved 8 August 2018. ↑ Paterson, Feast Days, p. v.
↑ Barrow, Andrew (11 August 1999). "Obituary: Jennifer Paterson". The Independent. Retrieved 8 August 2018. ↑ "Supporting the Future". The London Oratory. Retrieved 8 August 2018. ↑ "New DVDs: 'Two Fat Ladies,' in full". DVD Spin Doctor. 26 July 2008. Retrieved 4 October 2018.